Description This Cedartown, Georgia hotel has free internet access and non-smoking guest rooms. 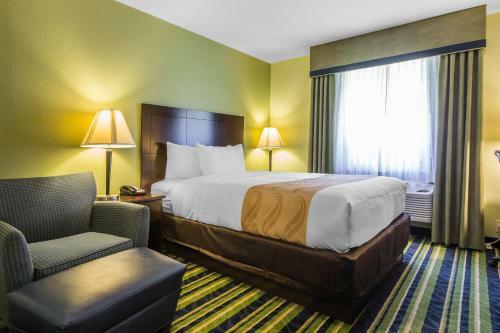 Quality Inn Cedartown puts our guests up in budget-friendly non-smoking rooms that are close to area attractions. This two-story 40-room hotel offers cable TV free Wi-Fi and daily continental breakfast. Non-smoking rooms are available. The front desk is open 24 hours for added convenience and parking is free. The hotel is on U.S. 27 18 miles from Rome and less than two miles from Polk County Museum in Cedartown. Berry College is about 22 miles away near Rome. Access to the Silver Comet Trail a converted rail line that is now a popular paved path for biking running and walking is less than five miles away. Downtown Atlanta and Six Flags Over Georgia theme park are each about 60 miles from the hotel. Hartsfield-Jackson Atlanta International Airport is 65 miles away. Add Quality Inn Cedartown to your free online travel itinerary.